Plus un individu a de « capital social« , plus il est impliqué politiquement et économiquement, comme l’ont montré les brillants travaux du sociologue Putnam. Une étude publiée au NBER montre que les Allemands qui étaient le plus impliqués dans la vie sociale ont aussi participé au développement du NSDAP. Social capital – a dense network of associations facilitating cooperation within a community – typically leads to positive political and economic outcomes, as demonstrated by a large literature following Putnam. A growing literature emphasizes the potentially “dark side” of social capital. This paper examines the role of social capital in the downfall of democracy in interwar Germany by analyzing Nazi party entry rates in a cross-section of towns and cities. 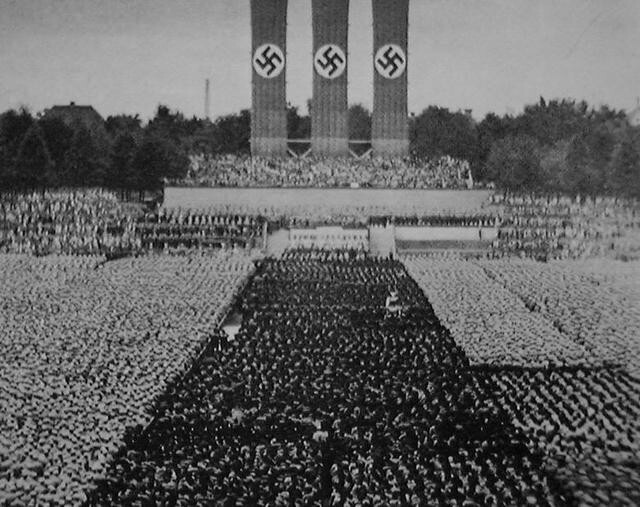 Before the Nazi Party’s triumphs at the ballot box, it built an extensive organizational structure, becoming a mass movement with nearly a million members by early 1933. We show that dense networks of civic associations such as bowling clubs, animal breeder associations, or choirs facilitated the rise of the Nazi Party. The effects are large: Towns with one standard deviation higher association density saw at least one-third faster growth in the strength of the Nazi Party. IV results based on 19th century measures of social capital reinforce our conclusions. In addition, all types of associations – veteran associations and non-military clubs, “bridging” and “bonding” associations – positively predict NS party entry. These results suggest that social capital in Weimar Germany aided the rise of the Nazi movement that ultimately destroyed Germany’s first democracy.